Calling it flawed and narrow and seemingly threatened by its contents, the leading United States business group and US government IP specialists are working to limit the impact of a recent United Nations report that made recommendations for the decades-old problem of ensuring affordable medicines reach people when they are under patent in a way that does not threaten innovation. One step in countering the UN report? Change the discourse in Geneva and elsewhere. She also pointed to the G20 – which includes all of the BRICS [Brazil, Russia, India, China, South Africa] – where language was inserted to promote protection of innovation. “We need more of that,” she said. “Leading by example in a multilateral environment isn’t an option, it’s a requirement,” she added. 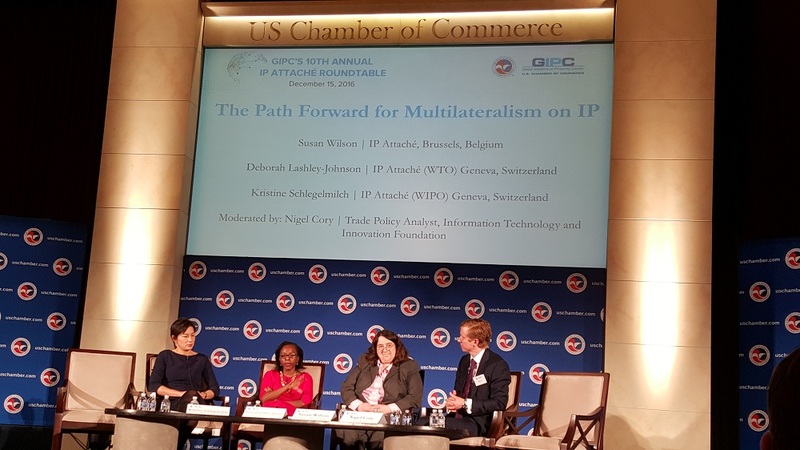 Speaking about the multilateral level were IP attachés Susan Wilson, Brussels (EU and its member states), Deborah Lashley-Johnson, Geneva (World Trade Organization), and Kristine Schlegelmilch, Geneva (World Intellectual Property Organization). She talked about various policy activities at WIPO, giving updates on committees such as the Intergovernmental Committee on Genetic Resources, Traditional Knowledge and Traditional Cultural Expressions (IGC), which held four meetings last year. A report on traditional cultural expressions is coming early this year and a decision on the mandate comes up at the October 2017 annual WIPO General Assemblies, she said. She mentioned that negotiations on a draft design law treaty continued to be stalled and it does not look promising in the near term. And she said that in the WIPO Standing Committee on Copyright and Related Rights (SCCR), technical discussions on a treaty for broadcasting rights will continue in 2017. She added that exceptions and limitations to copyright for libraries and archives and education and research institutions are a standing item on the SCCR agenda too. But she said there was “small but new movement” toward possibly opening SCCR for other topics to enter in, such as copyright in the digital environment, with agreed language calling for a study on the impact of digital developments on the evolution of national legal frameworks over the last 10 years. “We see that as a glimmer of light” to possibly open up discussions at WIPO on these issues, she said. But if SCCR opens up to start talking about these issues, it will likely be in a non-normative framework, she said. On geographical indications, she said the US continues to be very concerned about the Geneva Act, an agreement to include GI protection in an agreement on appellations of origin concluded by less than one-sixth of the WIPO membership. The US and a number of other countries follow a different approach and did not accept the agreement. The End of WIPO Treatymaking? Schlegelmilch said she thinks the end of the period of WIPO treatymaking has arrived, reflecting the difficulty in finding consensus at the UN agency in the past 5-10 years. The US sees a period of being able to use WIPO as “more of a think tank-like forum,” and are not seeing a lot of interest in the multilateral space, she said. But there is a “bright side” of being able to come together at the international level and hold “exploratory and hopefully constructive discussions” without the end goal always being an international treaty. “We would like to openly discuss technical issues and best practices” as countries are addressing issues at the national level. They would like to bring a “fact-based approach” to the discussions, and hope that by consistently bringing evidence to the conversation it will “lessen the amount of unsubstantiated anti-IP sentiment” which has caused at least at WIPO so many of standing committees to become political, she said. But there are activities at WIPO that the US strongly supports, she said, such as to assist countries on IP, such as developing national and regional IP infrastructure. 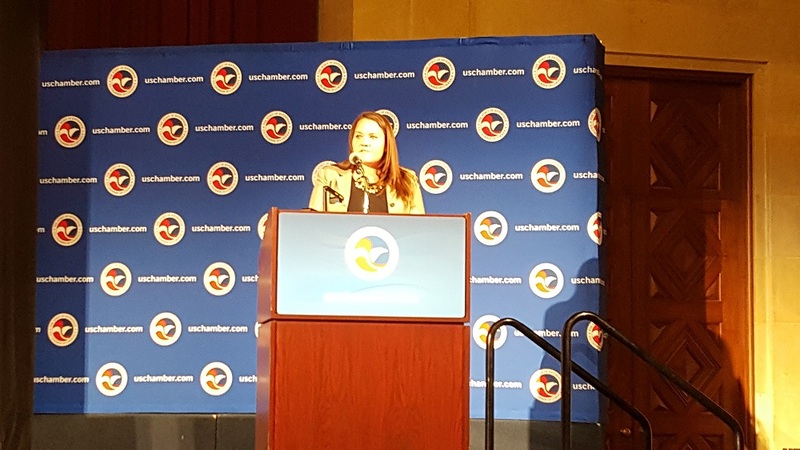 It also is doing positive work in developing partnerships, she said, perhaps with some in the room, and work with small and medium-sized businesses. The US also supports WIPO’s IP services for rights holders. The delegates also highlighted public health and access to medicines issues in Geneva as being a particular example where more attention is needed on evidence of the benefits of IP rights. The other IP attaché in Geneva, Deborah Lashley-Johnson, bashed the recently released report of the United Nations Secretary-General’s High-Level Panel on Access to Medicines. She said it was done without member state consultation and was too narrow in its focus by focusing on the ongoing problem of IP rights constricting access to medicines. A key aspect of the report was the recommendation that large economies like the United States not be able to bully smaller countries on intellectual property rights through the World Trade Organization. It also suggested thinking beyond the status quo, such as delinking medicine prices from the supposed cost of research and development so that medicines can be more affordable to all. Lashley-Johnson focused her discussion on how the US can “manage” the conversation about that report, as it has stirred interest and support among developing countries in a range of international policy arenas. The issue has become political, she said, so she suggested elements for a more positive conversation. What is needed in Geneva are more facts and studies, said Lashley-Johnson. Access to medicines is a far more complicated that just IP, involving issues such as poor infrastructure and stockouts. The focus on IP is “not helpful and quite dangerous,” she warned. In fact, protection of IP rights leads to greater access, such as to medical technologies. The UN report “missed the opportunity” to highlight other issues, she said, adding that to look at high prices there needs to be a greater understanding of what is going on in the market. It is important to make sure to get medicines to patients who need them, she said. In the trade world, they are faced with tearing down trade barriers. The US is “having this conversation” with other countries, such as Switzerland and South Korea, Lashley-Johnson said. The US raised the issue at the recent World Health Organization Executive Board and is expected to raise it at next week’s meeting of the WTO Council for TRIPS. They consider the High-Level Panel as the “starting and end point of the conversation,” she said, adding that the panel view was that IP creates a harmful commercial environment. But in fact implementation of the panel recommendations would create uncertainty, she argued. The strategy now is to broaden the conversation, coordinate the message, and promote what they are doing, Lashley-Johnson said, adding that they need to get fact-based information out there. She mentioned a trilateral study by the World Trade Organization, World Health Organization and World Intellectual Property Organization. Susan Wilson, based in Brussels, focused on activities at the European Union and the Organisation for Economic Cooperation and Development (OECD). “I think the time is now to bring that conversation back,” she said, suggesting finding a core set of challenges “we all agree on,” and building coalitions across silos. “We have the ability to change the conversation,” she said. The IP Attaché program places US diplomats in many offices around the world “to advocate US positions on intellectual property matters for the benefit of US stakeholders,” as stated in a program brochure. They not only raise issues with foreign governments and provide training and raise public awareness, but they also help US stakeholders doing business in foreign markets. The main focus is foreign laws, foreign courts, and IP enforcement. The GIPC event included US IP attachés based around the world. "US Business, Government Work To Bring Down ‘Dangerous’ UN Panel Report On Access To Medicines – And Change The Debate In Geneva" by Intellectual Property Watch is licensed under a Creative Commons Attribution-NonCommercial-ShareAlike 4.0 International License. What a croc. IP Attaches do nothing. Spend tax dollars and live high on the hog overseas. Vast majority are not even registered patent attorneys. None of them have real firm experience. They have done nothing tangible since their inception. Name 1 thing.